Having beneficial insects in your yard cuts down on the pesticides needed, and it can be fun for the children. One of my goals is to avoid introducing organic or inorganic chemicals into the yard. The reason for my decision is twofold: finding a way of cutting a cost; and making the garden safe for my children to enjoy. Cutting cost is not really a big priority for me, since I already spend a bit on my garden, but I think that I benefit from the knowledge of finding ways to reduce expenses to be able to pass that advice along to my clients. As for my children’s enjoyment, I feel that children love to be outside more when they have a space where they are engaged. 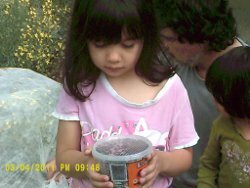 The releasing of the ladybugs became a big event for my children (and for the parents too), and this may kindle the desire to explore your own yard in your own children. Sometimes I forget that my children are lucky to have the home that they do. To encourage his daughter to be outside, a neighbor of mine drove his family to the beach. I have nothing against going to the beach, but his daughter could be outside on a regular basis if they let her loose in her own garden. Later that same day, my niece was shocked when she saw my daughter pick something off of a plant to eat. She immediately reported this infringement to me, whereupon I explained that she had picked a piece of broccoli for a snack. My niece could not recognize the broccoli on the plant. We sat down in front of that section of the garden, and I explained which plants were edible. Even later that day, that same niece was walking with us in The Village. She could not pass a certain spot. A bee was in the flowers. My daughters rushed to see the bee, while I placed myself between the bee and my niece, so she could pass. My niece feared that my daughters would be hurt. I explained that bees will leave you alone, if you leave them alone. Children benefit from this connection to nature. I think that their knowledge improves, and that they remain calmer. The great event for the children was the ladybug release. You will find packages of ladybugs in your garden centers. I think most are selling for around $10 You are supposed to release them at night, but I found this hard to do when having the little ones involved. We decided upon early evening. The garden had been watered earlier. The first step for us was a row cover. This is not always suggested on the package instructions, but it does help keep ladybugs in place until they settle in. Since we were not releasing at night , the row cover became more needed. We opened the container, and placed it under the cover. The girls squealed with excitement as they watched the beetles go along the top of the cover. They even caught a few who had escaped.. Most of your ladybugs will not stay in place. The big hope is that they find food, and they lay eggs, so you will start having your own ladybug colony. Since the great release, I find both daughters in that garden bed, conducting ladybug hunts. In fact, I am having a hard time getting them out of that bed. Each day they find one or two that they can show to others, and then they put them back. Katya was happy to catch her first lizard. The smile on her face was wonderful. Sakura had to hold the lizard, which she brought into the house to show her mother. This led to the “beast” escaping into the house, but they managed to chase it out of the door. Should you expect great things from one ladybug release? Maybe not. We will be releasing more in different areas around the yard. Once the beetles have established themselves, and we see the arrival of their offspring, I am sure that we will reap the benefits. So is this cheaper than using chemicals? Like many sustainable practices, the start-up cost is higher, but the long term cost is less. I do want to explain my objection to organic pesticides here. My personal belief is that the best chemical should be used for the job. If those chemicals pose a risk, whether organic or inorganic, then you need to weigh the consequences. Knowing that my daughters are always snacking from the garden, I choose not to use any chemical pesticides. If I could convince my daughters to bring their snacks inside to be washed first, I probably would use an organic pesticide. I do not think this will happen, so I stay away from anything which might have an effect. For this reason, I also stay away from certain plants. Oleander and foxglove are wonderful plants, but I do not want their toxins being fed to my daughters (or for my daughters to feed them to the dog, which they often do with their harvests).